Branding is crucial for any company, especially today. Whether a company has a good or bad reputation, a consumer can find out instantly on the Internet. When you are trying to stand out from your competitors who sell similar products, your brand makes a huge difference. Often, brand products and non-brand products are virtually identical, but consumers are willing to pay more for certain brands. The difference, again, is branding. If you can get people to feel good about your products and believe your products are superior, most of the battle is already won. Today, we look at a highly successful company that has built one of the best-known brands in the world through brilliant marketing. The value of its brand is estimated to be $15 billion. One look at the iconic “swoosh” logo and you know I am talking about Nike (NYSE: NKE). Nike is the largest sports apparel and footwear company in the world. It generates close to $40 billion a year in revenue. No competitor comes close. Footwear accounts for about 60% of sales, apparel for 30%, and various sports-related items contribute the rest. One of Nike’s most visible marketing strategies is to partner with popular star athletes. Sponsoring and signing endorsement deals with high-profile athletes and sports teams were great ways to increase publicity and brand awareness. Celebrities influence fans, so when the fans see their favorite athletes wear Nike, they are more likely to buy Nike, too. Over the years, the company has created countless memorable ads. In recent years, it’s also expertly used different social media channels to further strengthen the brand and engage customers. For example, Nike’s videos on YouTube garner millions of views. Nike content is often shared by viewers, which basically amounts to free advertising. Becoming a beloved consumer icon is often tantamount to possessing a license to print money. But marketing alone can only take you so far. There’s no doubt Nike sells quality products. The company also adapts to changing consumer tastes and continues to innovate. Some of its recent notable innovative products include Flyknit shoes that fit like a sock, and the world’s first self-tying shoe. How Has Nike Stock Performed? As the 10-year chart shows, Nike stock has made a lot of shareholders happy. Including dividends, $5,000 invested at the beginning of 2009 would have become more than $40,000 today. People are becoming more health-conscious and active. Also, athleisure—wearing athletic clothing even if you aren’t being active—has become trendy. As a result, demand for sports apparel and footwear has grown. Expansion in foreign markets also has been a big factor for growth. International markets now account for about 58% of revenue and the lion’s share of the company’s revenue growth. Nike still retains a leading position in the U.S., but competition is intense and the market is more mature, so revenue growth is much slower than overseas. 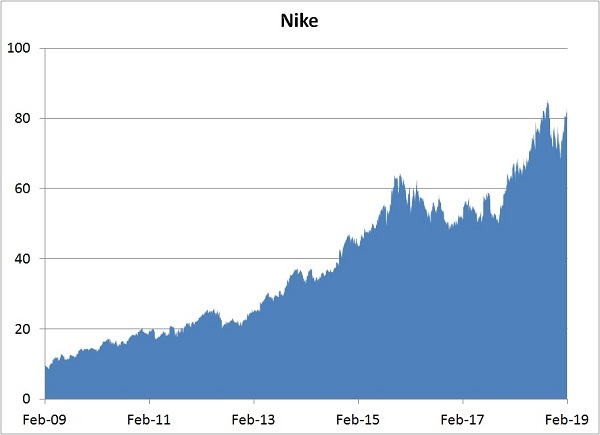 How Has Nike Stock Performed In 2017/2018? In 2017, Nike looked vulnerable to Adidas (OTC: ADDYY), which was coming on strong with fashionable sneakers backed by popular celebs like Kanye West and gaining market share. North American sales trends didn’t look good for a few quarters. As a result, the stock didn’t do very much that year. However, Nike has staged a comeback. 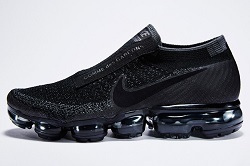 With new fashionable products like the Vapormax and React, Nike has returned to growth in the North American market. A focus on online channels also boosted online sales. As a result the stock rallied throughout 2018 until the fourth quarter, when worries about global slowdown and trade tensions intensified. Adidas came on strong in 2016 and 2017. It became the clear Number Two in North American sneaker sales. An endorsement deal with Kanye West has worked out well. In addition, famous reality stars the Kardashians and the Jenners have featured Adidas products prominently in their public appearances and social media. The company also signed endorsement deals with star athletes like James Harden and Aaron Rodgers. The company benefited from changing consumer tastes toward wearing sports apparel and footwear as casual wear. People want something that looks cool first and foremost. Adidas seized that opportunity and came up with attractive sneakers that proved popular. Nike has responded with new fashionable sneaker lines and seems to be winning back market share from Adidas. Puma SE is a German company. It’s the third largest sportswear manufacturer in the world. Puma and Adidas in fact were at one time part of the same company before splitting up in the 1940s. Puma generates about $5 billion a year in worldwide sales, putting it a distant third behind Nike and Adidas. In 2018 Puma re-entered the basketball market after almost a 20-year absence. It beat Nike with a larger endorsement deal offer to DeMarcus Cousins and also signed the top two picks in the NBA draft. 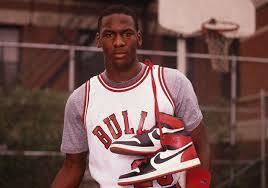 It also released its first basketball sneaker in the 21st century. Revenue has grown by at least 10% in each of the last two years. Although Nike and Adidas are both much bigger, Puma is no slouch either. Under Armour is another well-known brand in the sports apparel industry. Its business model is a little different than Nike’s in that Under Armour sells more clothing than footwear, but the two companies do compete in the areas that they overlap. We recently looked at Under Armour and determined that the Nike and Adidas stocks are better values. Will Nike Stock Go Up in 2019 (Should You Buy)? Consumer tastes can change rapidly, but through thick and thin Nike is still the clear Number One brand in sports apparel and footwear, a testament to Nike’s ability to innovate and market. The strong branding not only gives Nike pricing power with consumers and retailers but it also attracts partnerships with star athletes and sporting events (such as the World Cup). This turns into a virtuous cycle where more endorsements and exposure increases Nike’s brand recognition and continues to attract other partners, and so forth. Sure, Adidas did manage to make some gains, but last year Nike proved it has a strong counter-punch. It’s highly unlikely Adidas could ever match Nike’s revenue or branding. The company is building out its direct-to-consumer network (its own retail stores and website), which together account for about 30% of sales. Nike has even begun to sell on e-commerce giant Amazon (NSDQ: AMZN) through its dedicated channel, a retail advantage that should prove a multi-year boon. Selling directly to consumers allows Nike to control interactions with customers better and respond to their changing tastes faster. By cutting out the middleman, selling directly to consumers also helps margins. Growth has returned to even North America, its most mature market. What’s more, Nike is just getting started in Europe and emerging markets so there’s plenty of runway left in those markets. China is still a fast-growing market for Nike as well, even though Nike has been there for a long time. China sales grew 26% year over year in the latest reported quarter (ended November 2018). Even with its already large size, Nike looks to be a growth leader over the next decade. 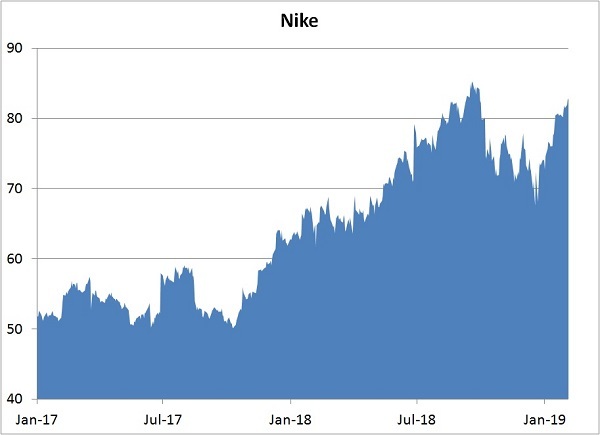 Will Nike Stock Go Down in 2019 (Should You Sell)? Nike operates in a very competitive industry. Adidas showed that it is possible (at least over the short term) to eat into Nike’s market share. On a macro level, a worldwide economic slowdown could negatively affect consumer spending habits. Nike products sell at a premium, so the pricing could become less affordable to some consumers if economic conditions deteriorate. Focusing more on selling directly to the consumer increases operational risks because Nike now has to run more stores. Nike stock trades at about 26 times projected 2020 earnings because of its strong market positioning, which means a misstep could result in an outsized stock decline. Although Nike stock trades at a premium, I believe it is warranted due to the company’s tremendous brand, leading market position and vast global reach. Barring an economic slowdown, Nike looks poised to keep growing in 2019. Look for revenue growth in the neighborhood of 7% and earnings per share to eclipse $3 a share in fiscal 2020 (May 2019 to May 2020). Changing consumer tastes are hard to predict, but over the years Nike has proven the ability to adapt. For example, it didn’t take long for Nike to regain momentum against Adidas. If there’s one clothing/shoes stock to bet on, my choice would be Nike. In ancient Greek myth, Nike was the goddess who personified victory. It’s an appropriate name for the maker of sports apparel. Well, we’ve found a way for you to declare investment victory. It has to do with a man named Donald J. Trump. The president of the United States is opening an investment opportunity… to the tune of $287,000. Amid the scandals, allegations of Russian collusion, and the longest government shutdown in history, there lies a rare chance for investors to quickly reap a windfall. We’re calling it the “Trump Impeachment Trade” and it’s your opportunity to make 28x your cash in the next 145 days if Trump gets impeached. The best part is, this trade can still make you a fortune, even if impeachment goes nowhere.